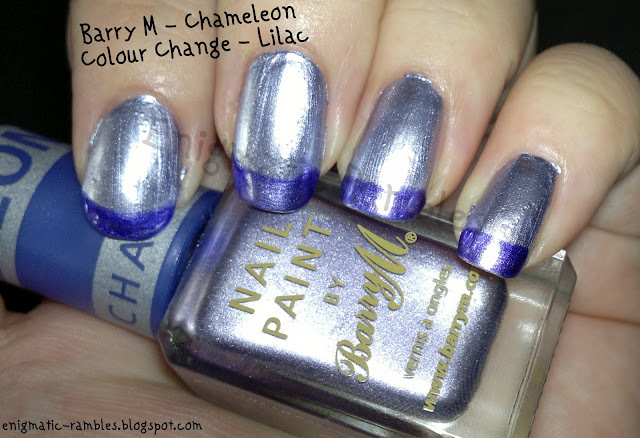 Basically this a polish which when you paint a topcoat on changes colour. In the photo I painted french tips on with a top coat. So you start off with a base coat and then a coat or two of the metallic finish polish and then your imagination is your limit! I'm not sure if I like this polish, in theory I like it and haven't actually seen anything like this on the market before. My issue lies with the fact it is a metallic finish polish which as we all know are notorious for streaking and brush strokes showing. However, this was my first attempt at using this so maybe I can get a good finish without bubbles. Plus if I get all creative with my designs then you won't be able to see any flaws with the polish! Don't let my perfectionist issues put you off the polish though, it is quite special! Thanks for the review I wasnt sure what to think of these but I think I will leave them! Fantastic in theory, reality not so much. Still very pretty though. I think with the french tip painted with the top coat it shouldn't chip easily. But I have heard metallic finish polishes chip very easily though. Normally I don't wear polishes long enough to chip mind!